Please write “ABBY ZOU” on the check memo line or in the memo or account field in your online bill payer. Abby Zou grew up in a beautiful city in the southeast of China. At the age of 18, she went to Beijing alone for college. On Christmas Eve of 2005, she became a Christian after a classmate prayed for her for two years. That was the last year of her college life. Since then, she has found in Christ the meaning of her life. Abby went to Hong Kong to get her Master of Design degree in 2007. After graduation, she worked at Hong Kong Institute of Education for two years. In 2009, Abby heard God’s clear call to go into full time ministry. She worked as Coordinator of Mainland Chinese and International Student Ministries in the chaplain’s office of Hong Kong Baptist University from 2010-2011. God used a vision of the boat in Luke 5:4 “Put out into deep water, and let down the nets for a catch ” and Hebrews 11:8 to call Abby to the US to study in seminary. Abby graduated with a Master of Christian Studies from Trinity Evangelical Divinity University. 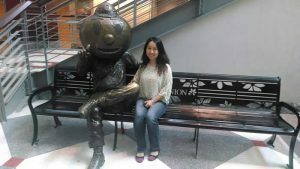 With the burden for international students, especially the large number of Chinese students at OSU, Abby was led by God to join IFI. She is devoted to evangelizing, caring, teaching, discipling and partnering with the international students. Abby teaches IFI’s interns, leads the Chinese fellowship, serves on worship teams, and mentors young Chinese believers.